Dorothy Allan (left) with Liz Turnbull, of North Tyneside Disability Forum. An organisation has thanked one of its unsung heroes for her work supporting it. Dorothy Allan set out to raise funds for the North Tyneside Disability Forum. The Forum, based at the Shiremoor Centre in Shiremoor, works with the physically disabled, vulnerable and chronically sick, deaf and blind, those with learning disabilities, carers, families and advocates, as well as groups and organisations. Dorothy set out to raise money throughout 2016 for the charity, setting up her own Just Giving page. For her annual Christmas Day charity walk she chose to raise funds for the NTDF. 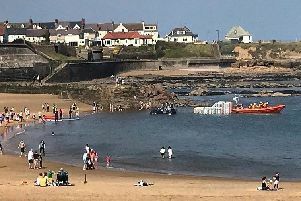 The walk took her from her son’s house in North Shields to her own in Seaton Sluice, passing through Tynemouth, Cullercoats, Whitley Bay, Earsdon and Holywell. Despite the wet weather, she completed the route in three-and-a-half hours. And so far she has raised £316 through the Just Giving page and walk.